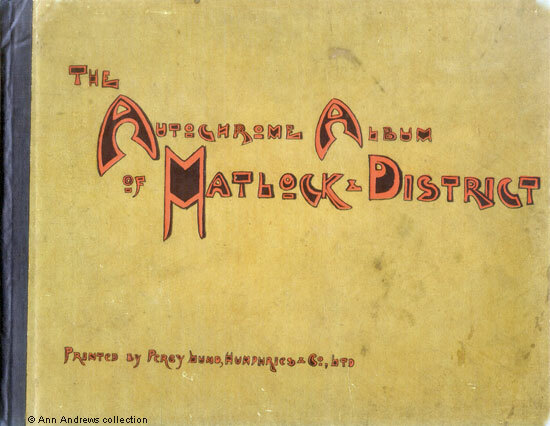 "The AutoChrome Album of Matlock & District"
The collection you click on above consists of twelve views, two pages of adverts and the front cover of the album's first edition. There's a superb picture of Crown Square showing both the tram about to depart and the shops that used to be on the edge of what is now the Hall Leys, but the photo was taken before the tram shelter was erected in the middle of the Square. 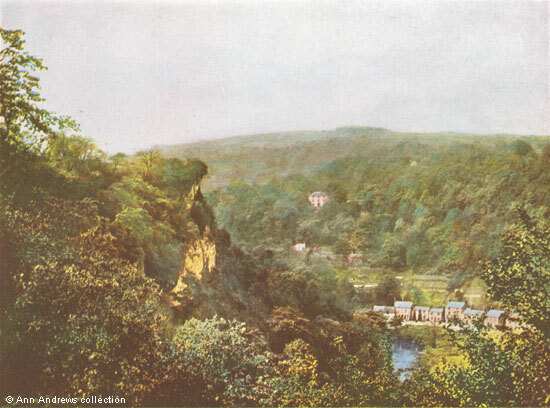 There are also two pictures of Matlock Bank, both showing green fields where houses now are. W. Pride, Fish Game and Poultry ..., Crown Square and Smedley Street. The album was printed by Percy Lund, Humphries & Co. Ltd. of Bradford. Whilst the album isn't dated, the advertisements help place the publication to between 1901 and 1911. Autochrome was the first method of colour photography using coloured starch pellets as a filter and, according to the V&A, the process was patented in 1904, although was discussed in articles about photography from the end of the nineteenth century. Whilst some of the photographs date from before 1900 the publication must, therefore, date from between 1904 and 1911. There was more than one edition of the album, as the cover shown at the top of the page is a different colour from the cover shown when you click the link to the images. The cover isn't the only difference between the two editions; a photograph of Matlock Dale replaced the view of Pig Tor and one of Matlock Bridge replaced the one of Crown Square. 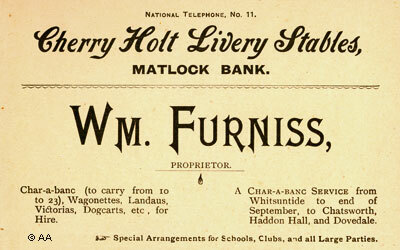 The advertisements were in a different order in the later edition and an additional advertisement was squeezed in for William Furniss at Cherry Holt. Below are the two replacement photos and the additional advertisement. 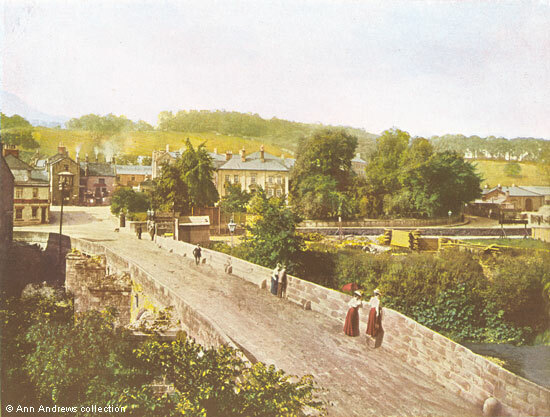 There are several small details of interest about this picture of Matlock's ancient bridge. A sign close to the entrance to Station Approach advertises W. E. Constable & Co. Wooden boards are stacked on the far side of the river bank, undoubtedly in preparation for the bridge being widened or as part of that work. There is also a workman's hut and at least two other signs, possibly of the contractors. Several adults were peering over the edge of the bridge, so are probably looking either at the preparatory work or the early stages of the widening scheme. "The AutoChrome Album of Matlock & District" (PC). Images on this page © Ann Andrews collection. Researched by Ann and provided and provided for personal use only. Percy Lund, Humphries & Co. Ltd. were printers and publishers of 71 - 75 Priestman Street, Bradford ("Post Office Bradford Directory", 1912). The business began in either 1887 or 1895 by Percy Lund, described in the 1901 Census as a Printer Publisher & Editor of Athol Road, and Edward Walter Humphries of Manningham. By 1911 Lund was living at 57 Southfield Square and was "Retired". The company the two men founded was eventually wound up in 1994 ("London Gazette"). Thomas Asbury had lived in Matlock Bath since 1891 (see his census entry for that year). He was still in Matlock Bath at the time of the 1901 census but by 1911 he had moved away and was living in Netherfield, Nottinghamshire. This helps prove a time frame for the two publications. See the magazine article "The End of a Long and Winding Road".